Does this make Stonehenge part of Constable country? Here we have John Constable’s “Stonehenge“, a watercolour over black chalk squared for transfer. Constable, an English Romantic painter was born in East Bergholt, Suffolk, on 11 June 1776, to Golding and Ann (Watts) Constable. His father was a wealthy corn merchant, owner of Flatford Mill in East Bergholt and, later, Dedham Mill in Essex. Golding Constable owned a small ship, The Telegraph, which he moored at Mistley on the Stour estuary and used to transport corn to London. Constable worked in the corn business after leaving school, but his younger brother Abraham eventually took over the running of the mills. John Constable is revered for his landscape paintings of Dedham Vale, the area surrounding his home, now known as “Constable Country.” His most famous paintings include Dedham Vale (1802) and The Hay Wain (1821). He died on the night of the 31st March, 1837 from heart failure, and was buried with his wife Maria in the graveyard of St John-at-Hampstead. 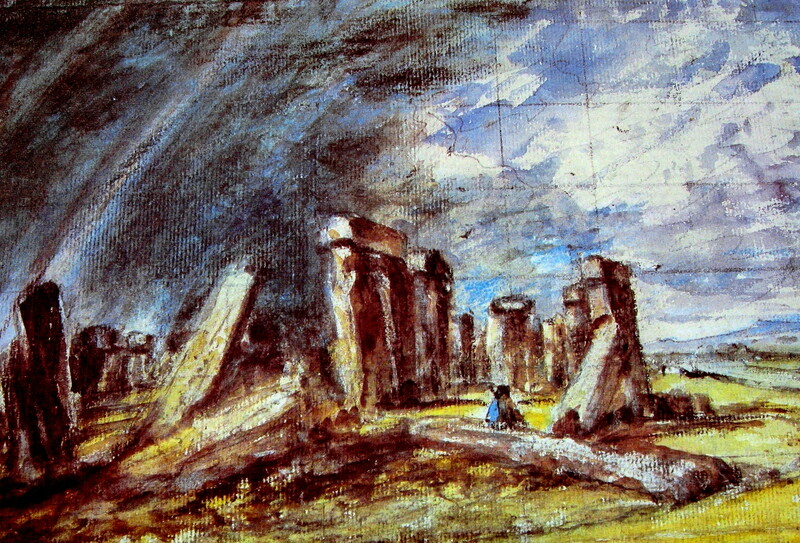 Stonehenge, on the other hand, being Constable’s artwork depicted here, is a prehistoric monument in Wiltshire, approx. 8 miles north of Salisbury. It is one of the most famous sites in the world, as well as being in the middle of some of the most dense complex of Neolithic and Bronze Age monuments in England. Archaeologists have attempted to date the site and have surmised that its origin is somewhere between 3000-2000 BC. Stonehenge and its surroundings were added to the UNESCO’s list of World Heritage Sites in 1986. This entry was posted in Gallery Art, Paintings, StreetArt and tagged Bronze Age monuments, druids, John Constable, Neolithic monument, stone circles, Stonehenge. Bookmark the permalink.